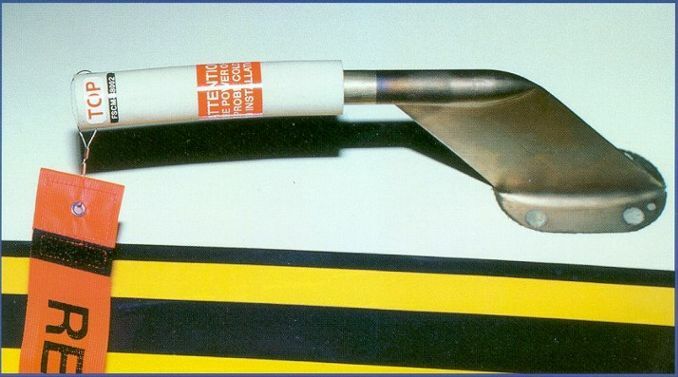 This Pitot Probe Cover developed by Nav-Aids Ltd. withstands temperature to 950 degrees F when installed on the pitot tube. Meets or exceeds fluid susceptibility per RTCA/DO-160D, Section II, Spray Test for, Jet A1, Hydraulic Fluid, Lubricating Oil, Isopropyl and Denatures Alcohol, Ethylene Glycol. Maximum Temperature : 950 degrees F. or 510 degrees C. for maximum 20 minutes. High Temp. Rubber Like Material. Weatherproof installation. Warning Flag Installed.